About three years ago I bought a cheap American Flag kit to fly off of our front porch at our family home in Winona, MN. The kit was made in the USA, cost only 8 bucks and included a metal pole and a 3X6 foot polyester flag. I thought about buying a real nice $50 cloth flag as I had done in past years, but our neighborhood is beset with inebriated collegiate “scholars” that love to steal anything not nailed down, including American flags. It seemed reasonable to “cut my losses” with the $8 flag. That cheap polyester flag flew in front of our house nearly every day for three years. It witnessed the marriage of my daughter and the death of my wife. It saw both beleaguered times and happy times; laughter and tears. And although it was made of cheap material, the flag was bright and clean, making all of us proud of the country she represented. Last week I noticed that the stripes were tearing apart and the end of the flag was frayed. It was time to get a new flag. 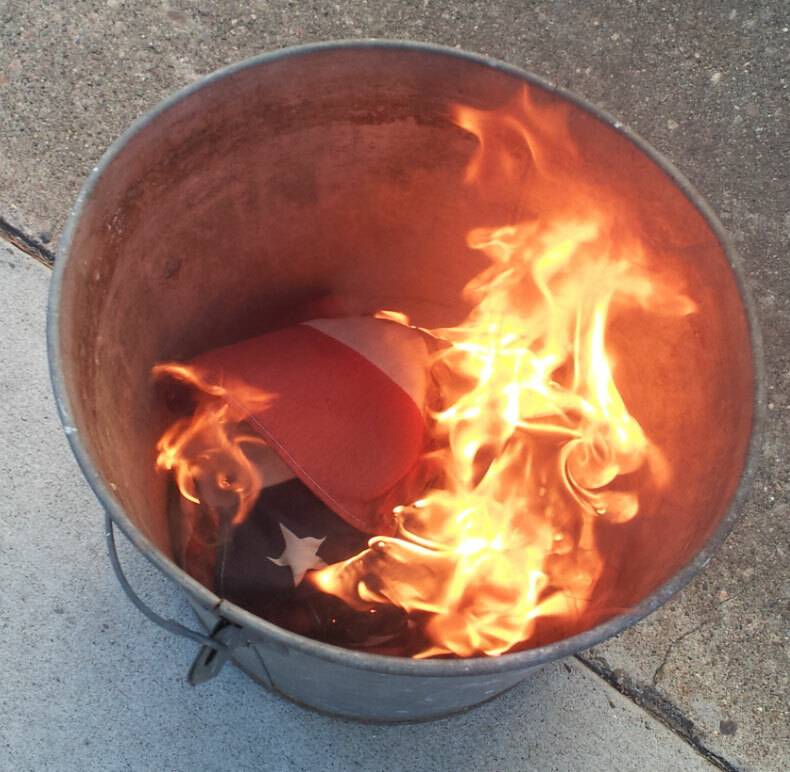 American flags are not to be thrown out, but deserve a fitting end…cremation. About a year ago I witnessed a “flag burning” of the official kind conducted by some military men. I decided I was going to burn my flag as well; in a dignified manner. I took my flag out on the driveway and ceremoniously placed it in an old (American made) bucket, where I touched it on fire. It went up like crazy, taking about 5 minutes before only the brass grommets remained. During those five minutes I said a silent prayer for this country and its people. I prayed for my family and for my friends. While my flag didn’t fly over the capitol, it flew over a place even more important to me; my home. As she disintegrated I thanked that little flag for flying on our porch for three memorable years. May she rest in peace, I said. I suppose many will read this blog as just foolish musings of an old man, but I was fortunate to be born in a great, even exceptional, (sorry Mr. Putin) country. America was once freer than it is now. It was once more fiscally sound. It once had 4 percent unemployment. It has always had, in my opinion, a better President than it now has. There are problems to be sure. When I was a kid growing up in Wyoming Ameirca was a wild frontier to me. She still is. Even in her current state America has more economic and social opportunities than anywhere else on earth. We will become energy independent in the next ten years. We will continue to be the fountainhead of ever more advanced technologies. We may even find our moral compass again. As that little flag flipped in the wind day after day, let us not forget every day to acknowledge what a great country this is.